This article did not post on Thursday due to a power outage. The internet continues to amaze and delight me. It has been a week of surprising connections on Shades leading to a wealth of information. A Shades article, The Mirror And The Camera, about Multigraph photographs caught the attention of Heinz-Werner Lawo, of Berlin, Germany. He wrote Shades with information regarding Multigraph photographs and his interest. 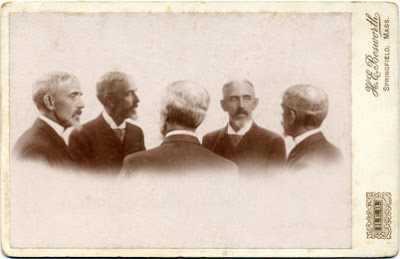 Heinz refers to the Multigraph as the Fivefold-Portrait which is clearly a much better name today for the photographic process, as multigraph is now a term associated with mathematics. Heinz writes that his interest in these mirror photos started about 25 years ago when he saw the photographic work of Marcel Duchamp and it was classified as a ‘photo-montage.’ It was, in fact, a mirror image or multigraph. As an art historian, Heinz wanted to write about and correct that error in identification. In 1997/98 and again in 2000 Heinz reconstructed the mirror cabinet as a temporary studio at a fair and made photos of about 300 people. Some of the photographs he made of himself during this period of time can be found on his blog. A modern version of an 1893 find. Two months ago he was asked to write an article about these Fivefold-Portraits for an exhibition catalogue. This gave him the inspiration to share his collected information freely with interested people. A summary of the article mentioned above, including photographs, can be found here. A link to the full article is found at the bottom of that page in the 'coda' section. As you might have noticed the old postcards and images I present are not all mine. In fact I have only a few. But I asked other collectors for permission to present their postcards or cabinet card in the context of all the others in my Blog. If you would like to support my work, please send uncut scans (300 or better 600 dpi) of your mirror photographs and the backs. We will all know more of these photos if we could compare the printed information on the backs. 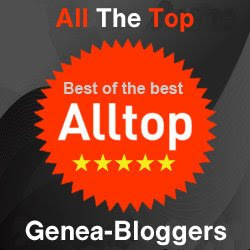 I believe my Blog could be in the near future a sort of online exhibition about a very special motive of photography from the beginning about 1893 till today. I have a small collection of Fivefold-Portrait photographs and postcards I am sharing with Heinz. You will remember my article on Just What Is A Collection? Well, I have two photographs and one postcard in my collection that are displayed below. 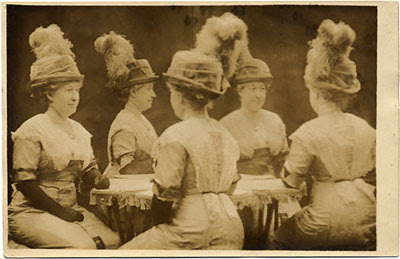 The first is a Real Photo Postcard (RPPC) of an unknown woman wearing a hat. You can differentiate an RPPC from a printed postcard by looking at the photographic portion of the card under a magnifying glass. A printed photograph is comprised of many small dots, an RPPC is solid, no dots. 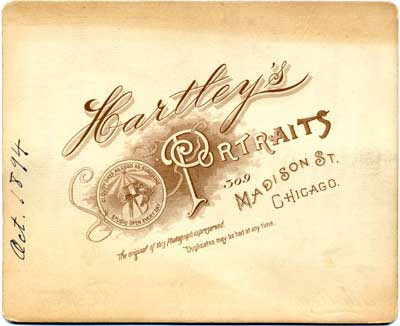 Real Photo Postcards are photographs that are reproduced by actually developing them onto photographic paper the size and weight of postcards that contain a printed postcard back. This card measures 5 1/4 inches (width) by 3 1/2 inches (height). The photographer is The Dittrich Studios, 1107 Boardwalk, Atlantic City. The postcard is dated April 1913. As has been discussed many times on Shades, when dating photographs where a date is indicated on the card, a good researcher does not take a written date as gospel. Does the card itself indicate that the written date could be correct? CYKO photographic paper was introduced by Edward Anthony in 1887. 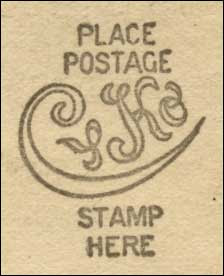 The CYKO logo using hollow rather than solid letters on postcard stock appears to have been available from 1906 to 1920. Our date of 1913 would fall within the indicated period of manufacture. I have not completed my research on the postcard. Left to be accomplished is the research of the photographic studio. The next Fivefold-Portrait in my collection is of an unknown woman photographed by Hartley's, 309 Madison Street, Chicago and indicates that the Multigraph apparatus is patented. The card measures 5 in. (height) X 6 1/4 in. (width). 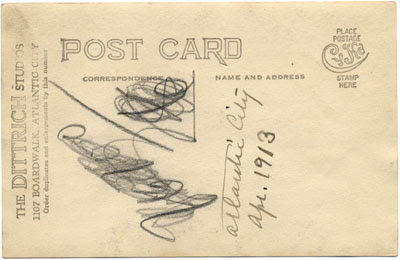 The date handwritten on the verso of the card is October 1894. The card stock is a very light cream or white with gold edges. The verso is yellowish brown in color. No research has been commenced on this photograph. 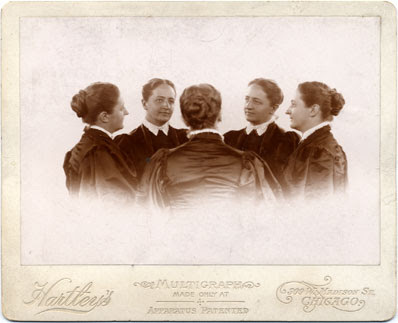 The last Fivefold-Portrait photograph in my collection is by far the most interesting. Professor Reichstein asked in his article "To what degree was this technique used by photographers catering to an upscale clientele?" This photograph may assist in that answer. Information for this photograph is scheduled for an upcoming Photograph Of The Week where you will learn about the wealthy man pictured, see photographs of his home, and learn of the famous and tragic life of his daughter. The verso of this photograph has been intentionally omitted due to the information it contains. It would let the POTW Cat out of the bag. Got your attention? I hope so! This is an extremely interesting story. Btw, I simply CAN'T WAIT to see what YOUR fave photo is for the carnival!